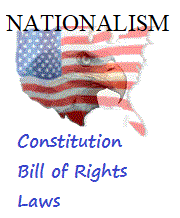 Nationalism is a political, social, and economic system characterized by the promotion of the interests of a particular nation, especially with the aim of gaining and maintaining sovereignty (self-governance) over the homeland. The political ideology of nationalism holds that a nation should govern itself, free from outside interference and is linked to the concept of self-determination. Nationalism is further oriented towards developing and maintaining a single national identity based on shared, social characteristics, such as culture and language, religion and politics, and a belief in a shared and singular history. Nationalism, therefore, seeks to build a national cultural identity, by way of pride in national achievements, and is closely linked to patriotism, which, in some cases, includes the belief that the nation should control the country's government and the means of production. In practice nationalism can be seen as positive or negative depending on context and individual perspective. Nationalism has been an important driver in independence movements around the world, such as the Greek Revolution, the Zionist movement that created modern Israel, and the Irish Revolution. It also was a key factor in the Holocaust perpetrated by Nazi Germany. More recently, nationalism became an important driver of the controversial annexation of Crimea by Russia. The word nation was used before 1800 in Europe to refer to the inhabitants of a country as well as to collective identities that could include shared history, law, language, political rights, religion and traditions, in a sense more akin to the modern conception.Nationalism is a newer word; in English the term dates from 1844, although the concept is older. It became important in the 19th century. The term increasingly became negative in its connotations after 1914. Glenda Sluga notes that "The twentieth century, a time of profound disillusionment with nationalism, was also the great age of globalism."